ChargeIt by Jay Circus Silver Border Glass Charger Plate 13"
Home > Products > ChargeIt by Jay Circus Silver Border Glass Charger Plate 13"
Perfect for use in upscale dinner settings, the ChargeIt by Jay Circus Silver Border Glass Charger is an attractive and elegant piece for presenting multi-course meals. 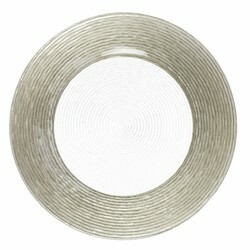 This charger plate is designed with mesmerizing rings along its rim which beautifully frames any size plate. Thanks to its glamorous silver hue, this charger easily complements any table decor and dinnerware collection. Made from premium quality glass, this charger plate boasts superior craftsmanship for unbeatable durability and product life. To properly care for this delicate-looking charger plate, hand washing is highly recommended.